Stardust Avenue is the most prosperous street in Stan City. Prosperity does not only refer to the liveliness of the avenue but also refer to the high level of patronage of every shop in Stardust Avenue. To be able to purchase the best-quality merchandises in Stan City, one must go to Stardust Avenue. Similarly, most of the highly-esteemed Enchanting Masters own their very own enchanting stores in Stardust Avenue. However, the Enchanting Master, which Cara had brought Ye Chui and Debbie to find, had his shop in an inconspicuous corner of a small alley within Stardust Avenue. The small alley, where the Enchanting Master’s shop is located, was right behind Cara’s Magic Bookstore. Right at the end of the alley was a simple straw shed, which had a dirty mess and gloom underneath it that was never before seen in the streets of Stan City. *cling, clang, clong* Sounds of continuous hammering reverberated from deep within the shed. From afar, the shed would seem like an ordinary blacksmith shop – definitely not a very good one in fact. “Here?” Debbie’s face was filled with worry as she thought of the disparity. It was a known fact that Enchanting Masters were people with high statuses. Seeing this decrepit shed in such an isolated alley caused Debbie to consider the five gold coins that she used, to be wasted. Hearing her introduction, Ye Chui’s heart palpitated with excitement. [Mount Blue?] Through reading the Aigen-Dazs Continent encyclopaedia, Ye Chui knew many things about the world, such as the fact that Dwarves were split into five tribes. As legitimate Dwarves live in caves within the mountains, their tribes were naturally named after mountains. They were namely the Mount Blue, Mount Purple, Mount Black, Mount White and Mount Dragon tribes. 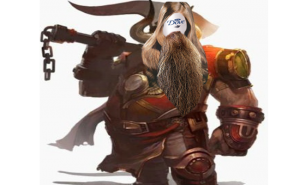 Cara addressed the stout silhouette of the Dwarf underneath as ‘Dove from Mount Blue’, thus it was obvious that he originated from Mount Blue. dwarves love to live in the mountain caves, which had a dark environment. Looking at the messy and dark conditions under the shed, it seems like the dwarves had similar customs and habits like the Giants. “Dove, come out quickly. I’ve brought you a disciple.” Cara bent down and shouted into the shed. The *cling, clang, clong* stopped almost immediately. Then, the stout figure put down his iron hammer and walked out of the shed slowly. Although the man appeared approximately 50 to 60 years old and was no taller than 1.2 metres, he did not give one the impression of being weak. Though petite, he had a muscular built and endless strength seemed to be stored within that miniscule body of his. Dwarves were born to fight wars, thus their battling abilities will definitely not pale in comparison to the Beastmen. Furthermore, since dwarves have a lifespan of about 200 years, he was considered relatively young. He had grimy black, long hair hanging from atop his head, and a long beard that was tied into two plaits. While carrying out his work, sparks would fly close to his beard, but thankfully it would only cause it to light up slightly and was insufficient to burn his beard. This Dwarf was wearing a thick layer of linen clothing and a dark coloured apron. However, light spots of pale discoloration could be seen on it, which was obviously the doing of the sparks. “Dove, this little brother is called Hammer. He is very interested in the enchanting technique and he hopes that you can impart your knowledge on enchanting to him.” Cara stood at the side, laughing. Remaining expressionless and silent, Dove extended his callus-filled hand, towards Cara. Debbie angrily brandished the great sword on her shoulder and stabbed in into the ground with a *clang*, before staring at Cara. However, Cara wasn’t intimidated or influenced by Debbie’s actions. She even started smiling sweetly and curling the ends of her long hair playfully. ”No!” Debbie cried out in a depressed state. “There is no need!” Dove said in an indifferent tone. He turned his head to take a look at Ye Chui, revealing a slight intent of teasing in his eyes. Finishing his piece, Dove tilted his head to look at Ye Chui, who became silent. Debbie, who was standing outside the store, was about to erupt into rage. She looked at Cara with bloodshot eyes, as if she was about to brandish her great sword to have it cleave into Cara. After Dove said his piece, he took out a black liquor bottle from the same cabinet, which he stored the hammer and chisel in, and twisted off the cover. *gulp, gulp* he drank, with eyes sparking, waiting to see a good show. It was common knowledge that no other race besides the dwarves would be able to grasp The Enchanting Technique in just one attempt, using the Mithril Hammer and Mithril Chisel. Cara, who was standing outside the shed, showed a curious expression but at the same time, also looked as though she was enjoying a good show. On the other hand, Debbie was filled with anticipation, wishing that Hammer would create a miracle; although she had absolutely no confidence in him. Ye Chui felt that he had an epiphany and held up both the hammer and chisel. He could feel a sense of connection with the two objects once his hand connected to it. It felt as though he was holding onto his magic wand. After all, the hammer and Chisel were both made by Mithril, a marvellous material that was extremely responsive to magic. Thus, engraving a magic matrix onto metal or other objects was similar to him making scrolls with magic ink, but the effects were much stronger. Ye Chui was prepared to carve out a magic matrix with the Chisel while pouring magic into the hammer. This was a simple feat, but there isn’t anyone who is able to complete it effortlessly, unless that person has a deep understanding of magic matrixes and is able to view all the magic symbols as one entity. Transferring the magic matrixes to the Magic Chisel is something that is at least 10 times harder compared to using a magic wand to cast a spell. If one does not have the means to transfer the magic matrixes to the Mithril Chisel, the whole matrix would simply collapse and disperse in contact with Mithril, resulting in failure. However, such an occurrence would only come forth to those without sufficient knowledge and preparation, something Ye Chui would not fail to overcome. In the eyes of ordinary Magicians, rows of magic symbols would seem just like magic symbols. However, in Ye Chui’s eyes, magic symbols were akin to a programming language that he can manipulate and create tens of thousands of different magic effects from his understanding. As the sharp end of the Mithril Chisel came into contact with the iron sheet, magic power is transferred to it. *Bang! * Ye Chui swung the Mithril Hammer and landed it on the top of the Mithril Chisel. Gradually, a marvellous pattern started emerging on the surface of the iron sheet. Well, good news, there are 3 applicants for editing. However, two of them did not reply over time… So, cross fingers that the last one is good! Omni-Magician – Chapter 35, An Enchanting Talent that is Greater than the Dwarves? love this series keep up the good work. wow! 1 try and he success! Thanks for the chapter!!!! However, I do admit that the author must really not know about programming. After all, it seems like he is saying that magical programmers only see their codes as codes without realizing their capability…………mmmm, if everyone truly became stagnant and never really tried experimenting or creating new spells due to their fears and stereotyping, I guess I can understand. Plus, I can admit that computer programming allows for greater safety and much greater experience when compared to magic of his current world. I just kind of wished the author would just point those things out instead of being mysterious or profound sounding, but I guess that is the nature of Xianxia novels. lol.